David Rodriguez: "I thank God I’m alive" - "The blood was squirting out like a sprinkler"
By John J. Raspanti, Doghouse Boxing: "The blood was squirting out like a sprinkler." - David Rodriguez. Heavyweight contender David Rodriguez has never lost a fight inside the squared circle. Last week, near a pizza restaurant in Scottsdale, Arizona, Rodriguez almost lost more than a fight. He came close to losing his life. 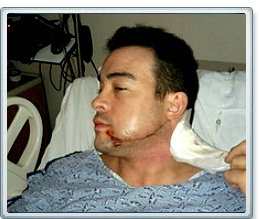 Rodriguez, 34, doesn’t recall all the particulars that led to him being viciously slashed from earlobe to chin. “To be honest, a lot of it's a blur," Rodriguez said. "I remember I came out of the club and went across the street to get some pizza. It’s weird, I really don’t remember much of anything except pictures – flashes. I think there were three black guys. There was no warning, nothing. I felt a hard hit against my head and a slice, I looked down and blood is pouring down my neck and shirt. The slash went from my earlobe, down my jaw line, back up under my chin. They tried to go for my jugular. They missed by a half an inch,” he said. A friend of Rodriguez’s witnessed the attack and raced over to help. 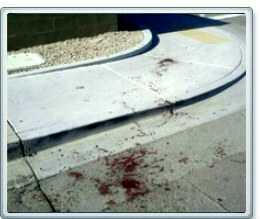 Within seconds, his friend was bleeding from a wound to the arm. Rodriguez remembers a woman putting a scarf over his head in an attempt to stop the bleeding. The cut would eventually require 100 stitches. There have been differing accounts of what happened that night, but Rodriguez, though still shocked by the incident, feels lucky. Will the cut cause any problems in future fights? Though undefeated as a boxer Rodriguez has faced some major setbacks in his career. Rodriguez is confident he can recover quickly from the attack. The affable heavyweight won all three of his 2011 fights by knockout. In December 2011, Rodriguez knocked out Byron Polley. The victory was the 36th of his career. “I went out there to execute my plan. I knocked him down twice in the first round and in the second it was over, “said Rodriguez. His next fight is sceduled for March of this year. The El Paso native has knocked out 34 of his 36 opponents. His goals (championship shot) for 2012 remain the same. Rodriguez wants his attackers caught as soon as possible. Despite the brutal attack, Rodriguez reflected on his good fortune. “I’m still here man,” he said with a chuckle.